The Spring migration season was another poor event in terms of accumulative or peak daily counts, yet there was perhaps the greatest variety of species seen this year as to make it memorable for that reason alone. Several scarce or sought-after species made it onto the year list at an early stage, even though there was no coverage during May and little within the first half of June. A generally sunny February and March (coupled with high-pressure and southerly winds) laid the foundations for many birds to move north from the Continent towards their respective breeding grounds in record time. Clear skies and such fine weather enabled birds to fly at a much greater height than a "normal" Spring would allow and hence - out of sight. Consequently, there were very low counts for many species. For many species, the first migrants generally arrived about a week early on average. This included both the earliest and main arrival dates. Although the traditional arrival patterns were similar to other years, the pattern produced by migrant Wheatears this year, was significantly different. Wheatears have always typically arrived within two distinct periods - from March 22-28th, then again four weeks later around April 22-26th. These periods are generalised, but are often quite reliable guides as to when to expect Wheatears. 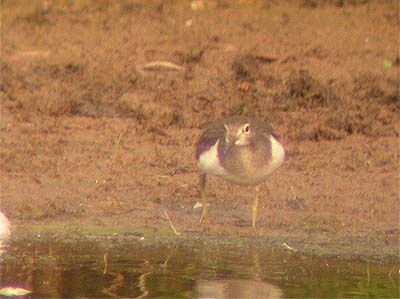 Normally there are few records between both periods, as mid-April migrants are unusual both at Eakring and within the rest of Nottinghamshire. 2003 was different in that there was just a single record within the first arrival period (March 24th) then only one before the main arrival of April 13-15th (six birds) followed by three more birds at the end of the month. It is likely that the late April Wheatear records of 2003, would correspond to those turning up during May in previous Springs. However, because of little coverage during May, this is only supposition at this stage. Fine weather is the most likely attribute to the sparcity of March records, as birds made their way quickly north. The only March date (24th) was in line with previous years. The timing of the first Ring Ouzel (to a greater extent) in the Midlands rather than just Nottinghamshire, usually coincides with the first migrant Wheatears and it still remains surprising that there have been few March records of Ring Ouzel. The general paucity of March Ring Ouzel records within the county up until 2000, is shown in the table to great effect, depicting that there have been just three records from the 1800's-2000. What the table does show very nicely, is that the occurrence of birds turning up in the Eakring and Kersall area, does fit in very nicely with the overall county picture. The two records from mid-April 2003 here, are just beginning to help reflect the similarity between recording area and county, by highlighting the mid-month peak. 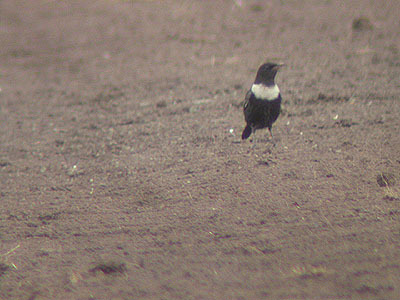 Ring Ouzels are still very rare here and prior to 2003 there hadn't been any records since the Kersall bird in 2000. The first of this year's two birds was found late morning in a newly cultivated area of pasture at Tug Bridge Farm, coinciding with the first wet and windy weather since early March. Presumably this had forced the bird to halt it's northward progress on this occasion, but a search the following morning proved fruitless and the bird was thought to have departed during the night. Weather has not particularly influenced previous records here, with all other birds being found on sunny and relatively windless April mornings. It was however the first to show well enough to allow photographs to be taken and indeed, spend any length of time out in the open. Despite a flock of 120 Fieldfare in the general area (at times in the same field) this male showed no association with them whatsoever, but as most of that flock had also departed next morning, it is possible that the Ring Ouzel could have gone at the same time. Quite surprisingly and despite the scarcity of migrant Ring Ouzels, the male flying north over Eakring Flash at 7:57am on April 14th, was my first ever individual to be recorded visibly on passage in ten years visible migration watching. Whilst the Ring Ouzels were (in themselves) very much highlights of the Spring period, there were others and a run of north-easterly winds and cloudy conditions saw good numbers of Little Gulls move through the Midlands. April 20th proved to be one of those extremely infuriating mornings and produced very few notebook entries as little moved through, yet a group of nine Little Gulls went low north-east over Eakring Flash. The group consisted of eight adults and one immature and is a record that (although expected eventually) still surprised a few people due to the agricultural nature of the area. Earlier, March had provided the first Waxwing record here since the 1950's when a group flew over Eakring Meadows. With so little to record moving visibly overhead, much of April was given over to the annual arrival of warblers. Chiffchaffs produced a joint earliest date with that of 2000 and good numbers soon followed. Chiffchaffs were just one species out of seven, which arrived early, but Blackcap (usually another traditionally early species) was late in arriving this Spring, when one would have expected them to appear just after the first Chiffchaffs. One of the most notable arrival dates was the Whitethroat which arrived a week early on April 15th. Indeed the arrival of the area's breeding warblers, was generally around a week early, but the arrival pattern of previous years was adhered to. Spotted Flycatchers were not recorded in Spring for the first time here, but that was probably down to coverage, rather than anything else and both Yellow Wagtail and Sand Martin were also late in arriving. With the weather being so condusive to migration, it was logical to think that most species would arrive early. Quite why Blackcaps failed to appear with Chiffchaff and Willow Warbler is a mystery. Right:- Table showing the annually occurring migrants which produced their earliest-ever arrival dates into the area during Spring 2003. A Common Tern north-west over Eakring Flash on March 24th, was not only the earliest-ever arrival date here, but also constituted a new earliest date for Nottinghamshire, beating the previous record of April 1st 1998, by some considerable margin. Personally, this was perhaps the most remarkable record of the Spring. Spring visible migration was overall very quiet. The quietness was occasionally broken by the best selection of waders at Eakring Flash in any Spring so far and there were records of Greenshank, Little-ringed Plover (now scarce here) Whimbrel and good numbers of Green Sandpipers. The normally reliable Meadow Pipit migration remained unusually quiet, although 100+ birds were recorded on one date in early April and the same general rule applied to Linnets, other finches and especially hirundines. The lack of hirundines was astounding, even when conditions were right to force good numbers to hold-up over Eakring Flash, there were very few and combined totals were still meagre. A feature noted throughout many traditional visible migration watch points across the UK, was the lack of any large passerine movements. Even reliable species like Starling and both Fieldfare and Redwing failed to cross the area in sufficient numbers as to generate any amount of excitement. The occurrences of both Leach's Storm-petrel and Arctic Skua, represented the first genuine seabirds for the area. Whilst Arctic Skua was always considered most likely, the opposite can be said for the latter. Fortunately, there was a camera on hand to provide some record photographs of the Arctic Skua and thankfully Robin Brace and Tony Wardell were in the right place at the right time to see the Leach's Storm-petrel near Eakring Flash. Appearing during a period of strong north-westerly winds, the Leach's occurred at Eakring Flash whilst I was walking around Eakring Meadows a mere mile or so away. It probably represents the single most important record, the area has so far produced. Robin Brace wrote at the time, "The bird came in from the NE at 10:40am on October 5th. Wind was moderate north-westerly with almost unbroken sunshine. It was already quite close when first observed and went directly over both observers at it's closest approach, with views to within 25-30m - and then headed towards the village. Was 'pestered' then by a corvid and descended close to the ground in the pastures area and was lost to view behind the hedge. It then re-appeared briefly over same hedge, but then lost behind trees and not seen again"
A total of three Marsh Harriers included one moving south-west over Eakring village on July 27th, a juvenile moving south-east over Eakring Flash on the evening of August 12th and a female at Eakring Field Farm on the morning of August 18th, before it drifted off high to the north. The Osprey which went south over Eakring Flash on August 24th, was the first here since 2000, but the Honey Buzzard which drifted over Red Hill on September 7th, continued the annual series of records in recent years. Add to these the Merlin at Eakring Flash on one October date, six different Peregrines and numerous sightings of Hobby, then 2003 was probably almost unlikely to be equalled for several years. The hot Summer, followed by a long and dry Autumn, meant that water-levels at Eakring Flash dropped to their lowest since it's formation in 1997. It was no surprise that numerous waders dropped in to feed on many dates. The bulk of the records came from regularly occurring species like Green Sandpiper and Greenshank, but there were also records of single Dunlin (in fields with the Golden Plover flock) and fly-over records of Curlew and Little Ringed Plover. Little Ringed Plovers have become a great deal rarer here since the late 1990's. Another species with similar statistics is the Common Sandpiper (left) Not since 1999 had there been any record of this common wader, so three on the same date that produced the Arctic Skua was very welcome. A long-staying Wood Sandpiper from August 6-11th was undoubtably the cream of the crop. For the first Autumn ever, there were no records of Whimbrel - normally a quite common species here. 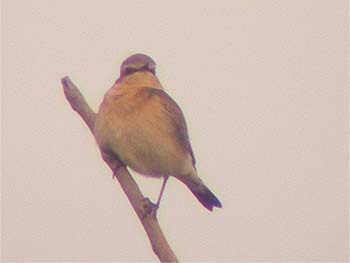 Other notable records from the period, included good numbers of Brambling on passage, a Common Crossbill briefly at Eakring Flash and a North Fenno-Scandia Chiffchaff of the race albietinus, found at Eakring Flash on November 16th. Two Lapland Buntings which flew over on November 13th, represented another new species for the area. It also took the year-list total to 140 species - a new record.